This lightened-up creamy chicken noodle soup is not only easy to make but it’s just as comforting as the classic and only 200 calories! 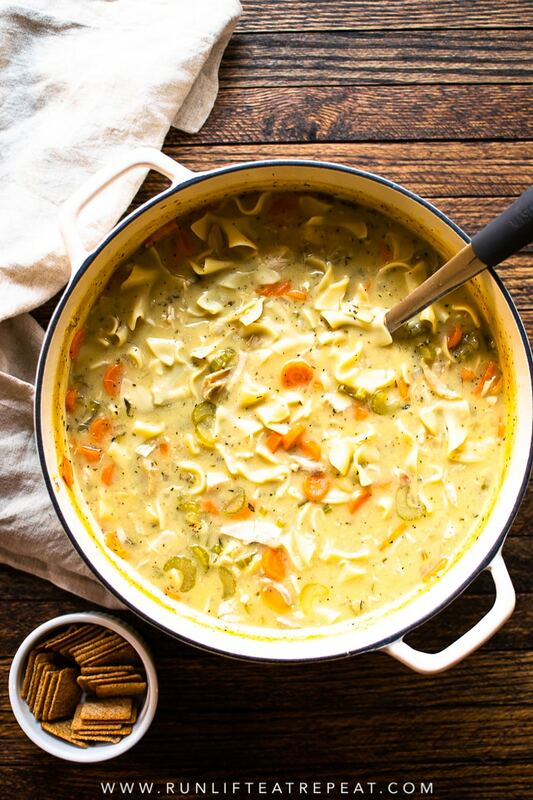 Since it’s now soup season and all, it only makes sense to share a soup recipe with you. 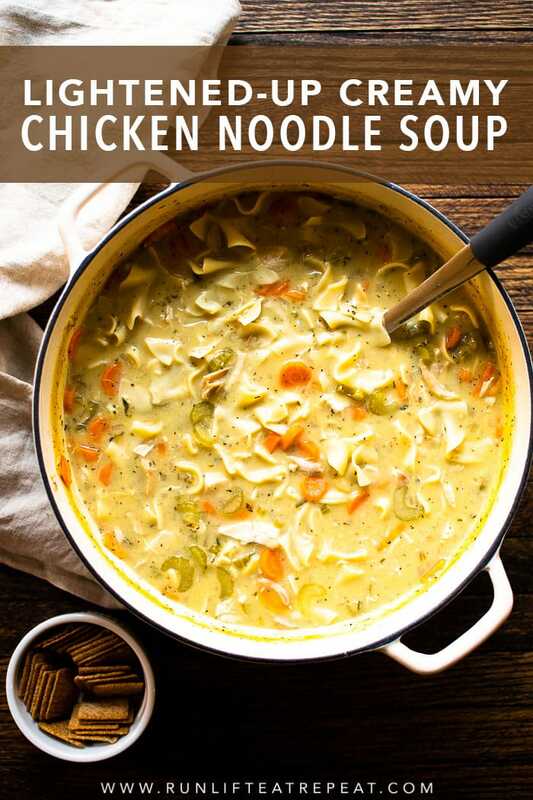 I haven’t been able to get this creamy chicken noodle soup out of my head for weeks. As the season started to change, the weather did not but that didn’t stop my mind from reminiscing of this recipe that I made at least 15 times last year. If you’re looking for a comforting yet lightened-up meal to add to your dinner rotation, this is it. One bowl of this soup left me satisfied for hours without feeling like my stomach was going to explode. And if you have a smaller family, it’s just the 2 of us, there’s plenty of leftovers for the week. 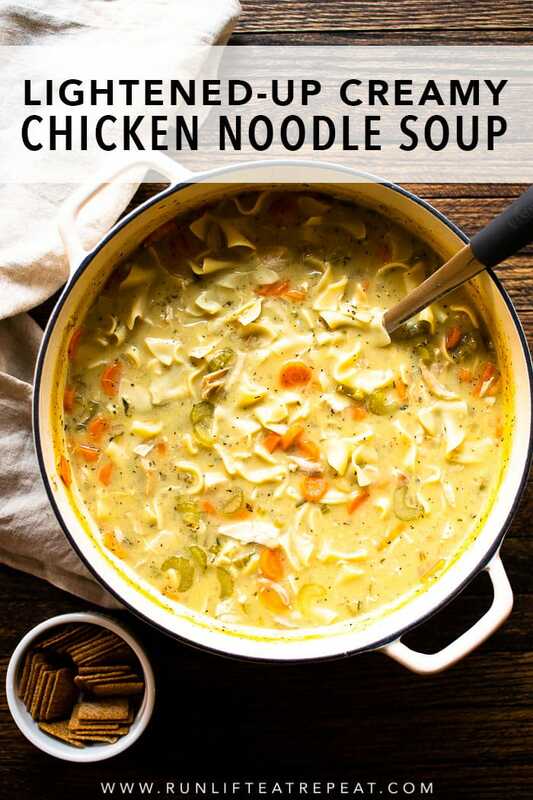 What Makes This Creamy Chicken Noodle Soup So Good? Hello flavor! 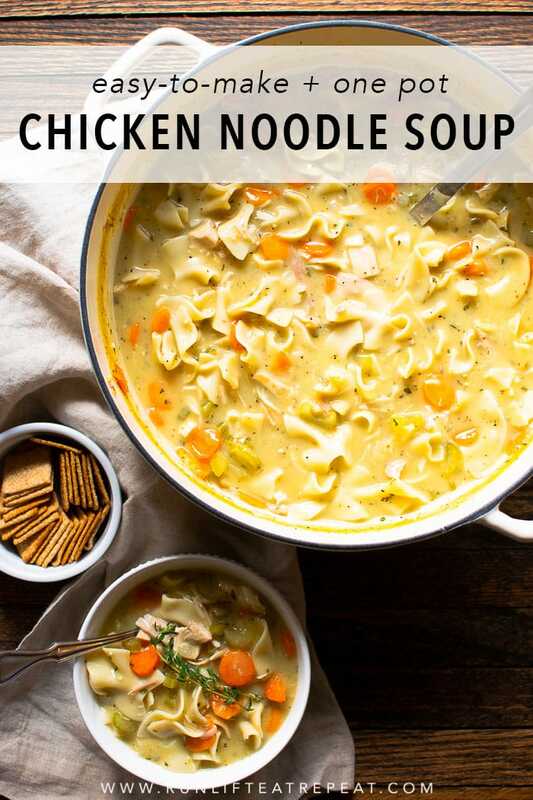 It’s from all the goodies inside: a mix of vegetables (celery, carrots + onion), loads of chicken, savory spices like thyme, parsley + garlic, noodles throughout all together in a slightly thick broth. I call it lightened-up because there’s no heavy cream, rather, a low fat % of milk or unsweetened almond milk mixed with a little cornstarch. 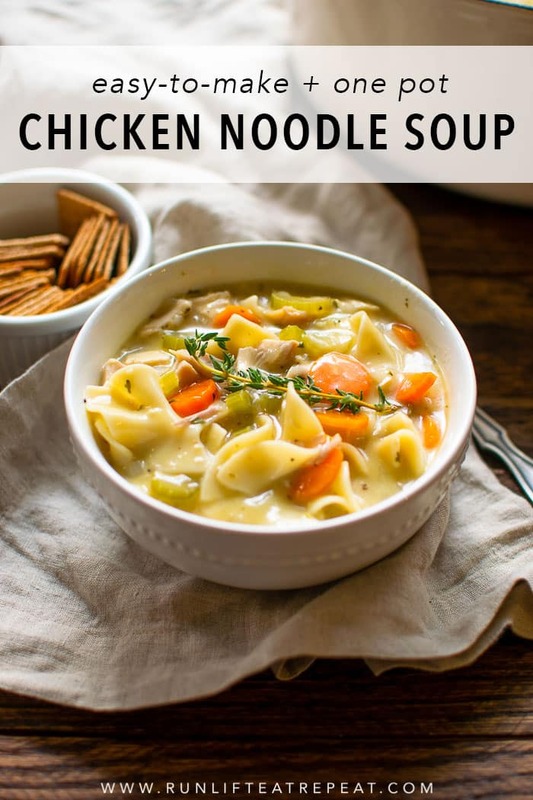 This soup is a favorite in our household (even my non-soup loving husband loves it!) It’s not only incredibly delicious but it’s one of those simple meals where there’s not much “work” that you have to do— especially if you opt for the slow cooker option (see my note in the recipe below.) Pair it with a salad, crusty bread or the classic grilled cheese sandwich <— because that’s always the way to go. And the best part, outside of the soup itself of course, the calories. For a 1 cup serving it’s only 199.5 calories and a whopping 18 grams of protein. 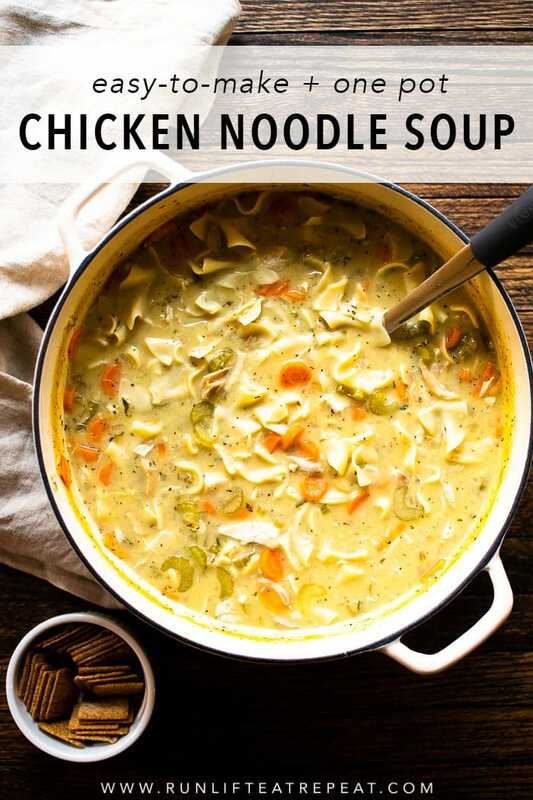 This comforting creamy chicken noodle soup will have you craving those chilly nights. 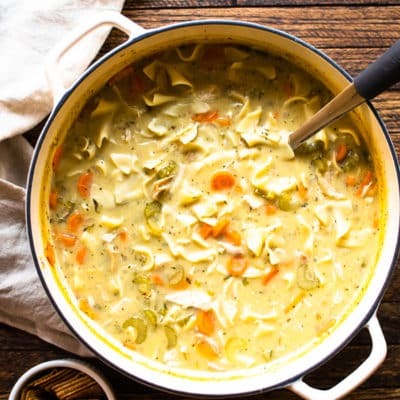 It’s basically the most delicious, hearty, thick-and-creamy, comforting yet lightened-up soup that you could ask for. Heat the butter in a 5 quart or larger pot or dutch oven over medium-high heat. Add the onion, carrots, celery, and garlic. Sauté for 5 minutes to allow the vegetables to soften. Add the oregano, parsley, thyme, salt, and pepper. Stir together and cook for an additional 5 minutes. Next, add the broth. Give everything a stir and scrape the bits up from the bottom of the pot. Bring to a boil, without stirring, for 2-3 minutes. Add the noodles and shredded chicken. Cook the noodles until tender— about 6-8 minutes. Combine the milk and cornstarch by stirring together until no lumps remain. The best way to do this: add the cornstarch to a large measuring cup or bowl, then add the milk slowly while stirring. Add the milk/cornstarch mixture to the soup. Allow the soup to cook for 3-5 minutes until the milk incorporates into the soup and it thickens slightly. Take the soup to see if it needs more seasoning. Serve the soup warm. Store leftovers in an airtight container in the refrigerator for up to 1 week. Make ahead tip: Leftovers keep will in the refrigerator for up to 1 week. You can add more chicken broth or water to the leftovers as it cooks— I normally do. The noodles soak up the liquid as it sits. The soup freezes well for up to 3 months. Thaw in the refrigerator the day before, then reheat on the stove. You can also put the frozen soup in a crockpot on low for 6 hours. Make in the slow cooker: Add 1-1.5 pounds boneless skinless chicken breasts, onion, celery, carrots, garlic, spices, and chicken broth to the slow cooker. Cook on low for 6 hours or high for 3 hours. 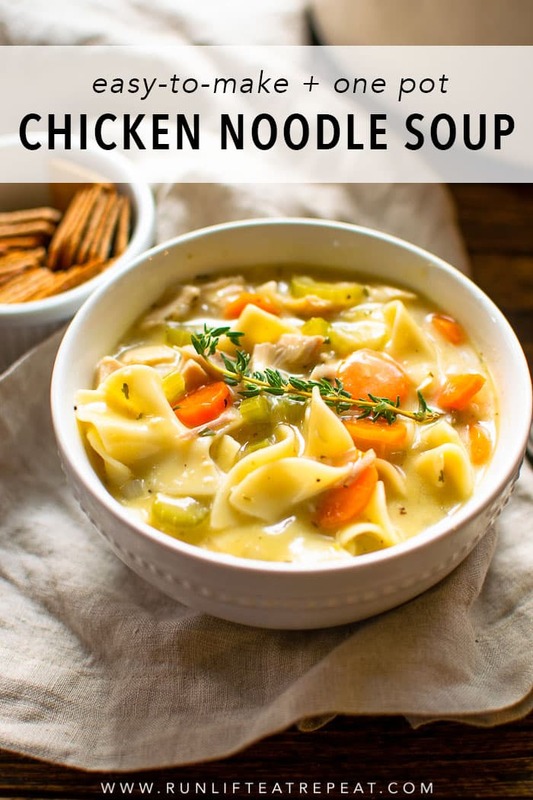 About 30-40 minutes before you want to eat, remove the chicken breasts and shred them, then place them back in the slow cooker with the milk/cornstarch mixture and egg noodles. Give it a nice stir. Allow to cook until the noodles are al dente— start checking at the 15 minute mark. It can take anywhere from 15-20 minutes. 1. To make this soup dairy-free, use ghee and unsweetened almond milk. That’s how I make it often. 2. I prefer to use low-sodium chicken broth. If you’re using regular, reduce the salt and taste as you go. 3. I use rotisserie chicken since it’s so easy but feel free to use what is easiest for you. 4. Using SparkRecipes, for a 1 cup serving it's 199.5 calories— 18g protein, 14.4g carbs, 7.5g fat. This is based on using ghee and unsweetened almond milk. If you'd rather something else, any milk fat % works but the calorie count will change. Previous Post: « Healthier Creamy Green Bean Casserole from Scratch. Looks delicious! 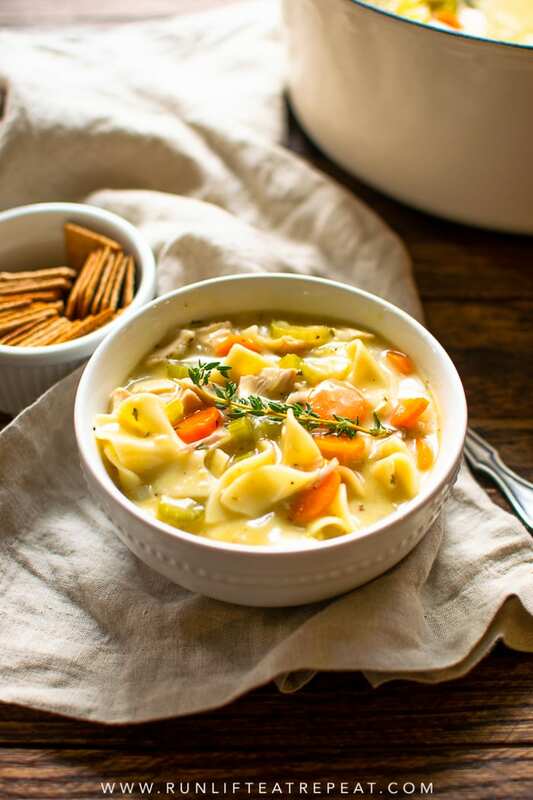 I love a good soup, especially during the fall/winter time! Same here! This is one of my favorites! Yummy! Definitely adding this to my list of recipes to try!